Objective: To evaluate the TRUCLEAR™ system (Smith and Nephew Inc., London, UK), a hysteroscopic system that morcellates and aspirates masses, in terms of the operating time, surgeon's convenience, and effect on patients compared with conventional electrosurgical resection. Methods: Patients undergoing hysteroscopic resection of endometrial polyps were randomly allocated to undergo hysteroscopic morcellation or electrosurgical resection (UMIN-CTR identifier: UMIN000019649). The primary outcome was the operating time. Secondary outcomes were the removal success, fluid deficit, convenience with the technique, insertion time, number of insertions during the operation, visibility of the operative field, recurrence of the patient's chief complaint, and adverse events. Results: Sixty-seven women were randomly allocated to the morcellation arm (n = 34) or electrosurgical resection arm (n = 33) from November 2015 to November 2016. The polyps were completely removed, and no adverse events were observed in all 67 patients. The average operating time (8.3 min vs. 12.0 min, P = 0.014), insertion time (5.0 min vs. 9.0 min, P < 0.001), and number of insertions (1.0 vs. 8.2, P < 0.001) were significantly lower in the morcellation arm than in the electrosurgical resection arm. Surgeons' subjective evaluation measured on a 10-cm visual analog scale was higher in the morcellation arm than in the electrosurgical resection arm in terms of easiness of removal (8.4 vs. 6.5, P < 0.001) and visibility of the operative field (7.8 vs. 6.4, P < 0.001). Conclusion: Surgeons gave the hysteroscopic morcellator system a better evaluation compared than electrosurgical resection, and the system shortened the operating time. Hysteroscopic resection of endometrial polyps is performed when the symptoms of abnormal uterine bleeding, hypermenorrhea, or infertility are present. About 6700 hysteroscopic surgeries for endometrial polyps in the operating room (OR) settings were performed in Japan in 2015 according to the health insurance statistics of the Ministry of Health, Labour, and Welfare. To remove endometrial polyps, monopolar, or bipolar surgical resection is widely used in Japan. However, several insertions of the hysteroscopic device are required to cut and retrieve the intrauterine polyps. Frequent insertions of electrosurgical devices may make visibility of the operative filed worse and extend the operating time. A new technology called hysteroscopic morcellation was invented by Emanuel in 2005. Intrauterine endometrial polyps are cut and aspirated by a disposable mechanical cutting device of this morcellator system. As this mechanical cutting device can simultaneously cut and aspirate intrauterine masses, frequent insertions are not needed to retrieve the mass, keeping visibility of the operating field clear and shortening the operating time. The hysteroscopic morcellator system is widely used in the United States and Europe. Several randomized, controlled trials (RCTs) comparing electrosurgical resection and morcellation have shown the advantage of the morcellator system in terms of the operating time.,,, However, the hysteroscopic morcellator system is not widely used in Japan. The TRUCLEAR™ system (Smith and Nephew, Inc., London, UK) is used at a very small number of institutions, and the MyoSure ® system  (Hologic Inc., Marlborough, MA, USA) has not been introduced in Japan. We had the opportunity of using the TRUCLEAR™ system at our institution in 2015. The aim of our study was to evaluate the hysteroscopic morcellator system by comparing it with monopolar electrosurgical resection for removing endometrial polyps in Japanese individuals with respect to the operating time, surgeons' subjective evaluation of the device, and medium-term outcomes. A single-blind, parallel group, randomized study comparing hysteroscopic morcellation with electrosurgical resection was conducted after obtaining approval from the Institutional Review Board of Teikyo University (approval number: 15-042, UMIN-CTR identifier: UMIN000019649). All women with indications for endometrial polypectomy were invited to participate in the trial. All eligible women were diagnosed as having endometrial polyps based on an office hysteroscopy. Exclusion criteria were as follows: (1) patients who received hysteroscopic polypectomy before, (2) patients with uterus bipartitus, (3) patients with intrauterine adhesion, and (4) patients with endometrial carcinoma or suspected of having endometrial carcinoma. 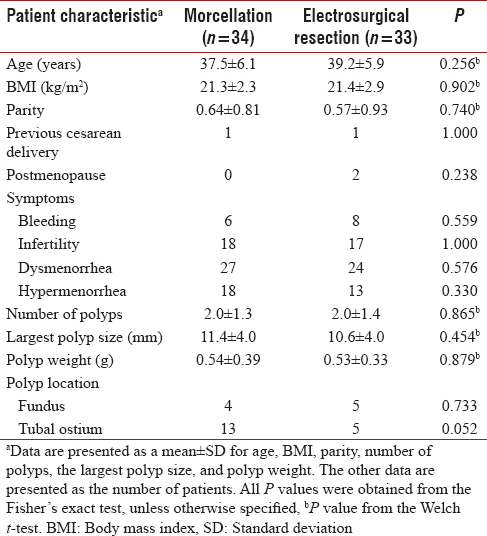 The number and size of polyps were not exclusion criteria. Written informed consent was obtained from all patients. Participants were randomly assigned in a 1:1 ratio to the hysteroscopic morcellation or electrosurgical resection arm. All surgical procedures were performed in the OR setting with general anesthesia. Five surgeons who had extensive experience with performing electrosurgical endometrial polypectomy conducted all the surgical procedures (A. T., Y. K., O. N., R. M., and Y. T.). All surgeons had performed polypectomy for at least five cases with the TRUCLEAR™ system before participating in this trial. Electrosurgical polypectomy was performed with a rigid 8.6-mm monopolar resectoscope (Olympus Corp., Tokyo, Japan), equipped with a 12° optic. Hysteroscopic morcellation was performed using the TRUCLEAR™ 8.0 system, with a 0° optic and a 9-mm sheath and 4.0 rotary morcellator. We performed hysteroscopic morcellation with the technique of mechanical morcellation previously described. All participants were pretreated with a disposable, absorbent cervical dilator (Lamiken-R KL-30, Ken Medical, Inc., Hyogo, Japan) the day before polypectomy. The hysteroscope was introduced into the uterine cavity after dilating the internal os of the uterine cervix with Hegar dilators. Normal saline (TRUCLEAR™) or 3% D-sorbitol (resectoscope) was used to distend and irrigate the uterine cavity. We used the Hysteroscopic Fluid Management System (maximum pressure setting of 120 mmHg and maximum flow setting of 700 mL/min; Smith and Nephew, Inc.) to perform hysteroscopic morcellation, and D-sorbitol was used for irrigation with a pressure of 70 mmHg without a specific pump for electrosurgical resection. After introducing the hysteroscope, we observed the uterine cavity thoroughly and then performed polypectomy and finished the procedure after confirming total removal of the endometrial polyps. All hysteroscopic procedures were recorded to DVDs. Surgeons performed a subjective evaluation measured on a 10-cm visual analog scale of the maneuverability of the device, easiness of removal, and visibility of the operative field immediately after completing polypectomy. At the 4-week follow-up, second-look hysteroscopy was performed, and women were asked to complete the questionnaire regarding menstrual flow and menstrual pain before and after polypectomy. At the 24-week follow-up, ultrasonography of the uterine endometrium was performed, and women were asked to complete the questionnaire again. The allocated interventions were confidential to the participants until completion of the 24-week follow-up. The primary outcome measure was the operating time. The operating time was defined as from the time that cervical dilatation started until completion of the procedure, meaning removal of the hysteroscope from the uterine cavity. The secondary outcome measures were removal success, fluid deficit, convenience with the technique, insertion time, number of insertions during the operation, visibility of the operative field, recurrence of the patient's chief complaint, and adverse events. The installation time was defined as from the time at which cervical dilatation started till visual introduction of the hysteroscope. The insertion time was defined as the time from visual introduction until completion of the procedure. Therefore, the operating time equals to the installation time plus the insertion time. The sample size was calculated based on the prospective trial of van Dongen et al. In addition, their results showed that the mean operating time for morcellation was 10.6 min compared with 17.0 min for resectoscopy, with a standard deviation of 9.5 min in both groups. This difference of 6.4 min was considered clinically relevant. Therefore, to detect a difference in the sample size, considering the clinically relevant operating time of 6.4 min, we set the level of a type I error (α) at 0.05 and the desired power of the study (1-β) at 90%, and we calculated that each group should include at least 48 participants, 96 in total. To account for attrition, we aimed to enroll 120 participants. The Welch t-test was used to assess the statistical significance of observed continuous value. The Fisher's exact test was used to compare dichotomous variables. P < 0.05 was considered statistically significant. Statistical analysis was performed using the JMP 12.0 software (SPSS, Chicago, IL, USA) for Windows. We have conducted this trial after obtaining approval from the Institutional Review Board of our institution (approval number: 15-042) Clinical trial registry (UMIN-CTR identifier: UMIN000019649) on 19/Nov/2015 prior to the operation of the first case. The registry can be seen at following website. https://upload.umin.ac.jp/cgi-open-bin/ctr_e/ctr_view.cgi?recptno=R000022582. All relevant information has been approved by each patient, and we have obtained written informed consent from each patients. Ninety-four patients were enrolled in this study from November 2015 to November 2016. Seventy patients were randomized; 35 patients were allocated to the morcellation arm (TRUCLEAR™) and 35 were allocated to the electrosurgical resection arm [Figure 1]. All patients received the allocated treatment. One patient in the morcellation group was excluded from the analysis because of discontinuation of the intervention due to machine failure, and two patients in the electrosurgical resection group were excluded because no polyps were found or the DVD recording of operative procedure was missing. There were no significant differences in patient characteristics between the two groups [Table 1]. Surgical data for the hysteroscopic device are summarized in [Table 2]. The average operating time (=installation time + insertion time) to complete polypectomy was 8.3 min for morcellation compared with 12.0 min for electrosurgical resection (P = 0.014, Welch t-test). Similarly, the average insertion time was significantly shorter for hysteroscopic morcellation (5.0 min) than for electrosurgical resection (9.0 min; P < 0.001, Welch t-test). There were no significant differences in the installation time between the two groups. The number of insertions was significantly less in the morcellation group than in the electrosurgical resection group (1.0 vs. 8.2 times; P < 0.001, Welch t-test). There were no significant differences in fluid use between the two groups; however, the fluid deficit was significantly more in the morcellation arm than in the electrosurgical resection arm (318 mL vs. 179 mL; P = 0.020, Welch t-test). Surgeons' subjective evaluation of the hysteroscopic device is summarized in [Table 3]. There were no significant differences regarding maneuverability of the device between two methods. In terms of easiness of removal and visibility of the operative field, surgeons gave the hysteroscopic morcellator device a better evaluation than the conventional electrosurgical resection device. Follow-up data at 4 weeks and 24 weeks postoperatively are summarized in [Table 4]. At 4 weeks postoperatively, the recurrence of endometrial polyps was observed in one patient who underwent electrosurgical resection, but it was not observed in any patients who underwent morcellation. At 4-week follow-up, there were no significant differences in the reduction of hypermenorrhea between the two groups, but a significant decrease of dysmenorrhea was observed in the morcellation group (morcellation group: 19 of 27 (70%) vs. electrosurgical resection group: 9 of 24 (37%); P = 0.025, Fisher's exact test). Forty-six of 67 patients (68%) received a follow-up examination at 24 weeks postoperatively. None of the 46 patients experienced recurrence of endometrial polyps. There were no significant differences in the decrease of hypermenorrhea or dysmenorrhea between the two groups. To the best of our knowledge, this is the fifth RCT about the hysteroscopic morcellator system in the world and the first RCT in the Asia-Pacific region. We observed a 30% reduction in the operating time in the morcellation group for the removal of endometrial polyps in the OR setting. 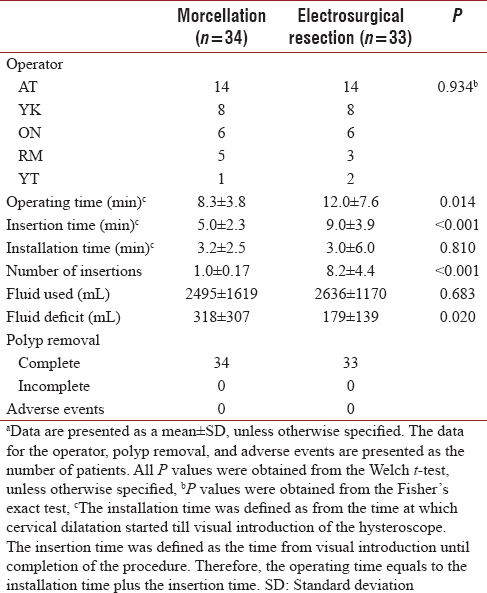 In addition, we found that hysteroscopic morcellation was equally as effective as electrosurgical resection in regard to removal success, recurrence of polyps, and adverse events. Hysteroscopic morcellation received a higher evaluation from surgeons in the aspects of easiness of removal and visibility of the operative field. Our results of the reduction in the operating time with hysteroscopic morcellation confirm the results of four previous RCTs and systematic reviews.,,,,, In hysteroscopic morcellation, the simultaneous cutting and aspiration of polyps may have reduced the number of the device's insertions and thus reduced the operating time. Regarding the fluid deficit, our results showed that it was significantly more in the morcellation arm than in the electrosurgical resection arm (318 mL vs. 179 mL; P = 0.020), which was contrary to that reported in two previous RCTs in which the fluid deficit was investigated. In van Dongen's study, there was no significant difference of fluid deficits between the morcellation arm (409 mL) and electrosurgical resection arm (545 mL, P = 0.224), and in Hamerlynck's study, there was no difference between the morcellation arm (165 mL) and electrosurgical resection arm (200 mL, P = 0.115). The fluid deficit may be influenced by various factors, such as the operating time, kind of distention medium, and pressure of the medium used to distend the uterine cavity. It was considered that in our study, the pressure of irrigation fluid in the morcellation arm (maximum pressure setting of 120 mmHg provided by the Hysteroscopic Fluid Management System), which was higher than that in the electrosurgical resection arm (a pressure of 70 mmHg with hydrostatic pressure provided by gravity), might have caused more fluid deficits in the morcellation arm; whereas, the pressure used in the morcellation arm (maximum pressure setting of 120 mmHg) was lower than that in the electrosurgical resection arm (maximum pressure setting of 150 mmHg) in Hamerlynck's study. The fluid deficits observed in our study in the morcellation arm (318 mL) and electrosurgical resection arm (179 mL) were not thought to cause water intoxication because a fluid deficit of 2500 mL (when using isotonic solutions, e.g., normal saline used in the morcellation arm) or 1000 mL (when using hypotonic solutions, e.g., 3% D-sorbitol used in electrosurgical resection arm) should be used as a threshold to define fluid overload according to the BSGE/ESGE guideline. Therefore, both morcellation and electrosurgical resection in our study's setting are thought to be safe with regard to the fluid deficit. There are three points unique to our study. The first point is that in each operation, we collected the surgeons' detailed evaluation of the hysteroscopic devices. No previous RCTs have investigated surgeons' detailed evaluation. In van Dogen et al. 's study, only the convenience of the device was evaluated on a visual analog scale, and the morcellator system acquired a better score than electrosurgical resection. In our study, surgeons determined that the hysteroscopic morcellator system was easier to use for removing polyps and it provided a clearer vision of the operative field than electrosurgical resection system; this may have contributed to the shortened operative time. The fact that surgeons with extensive experience of electrosurgical resection and little experience with the morcellator system, who participated in our trial, gave the morcellator system a better evaluation, strongly suggests the superiority of the morcellator system to the electrosurgical resection system because all the surgeons just started using the morcellator system. These superior evaluations encourage us to continue using the hysteroscopic morcellator system in the future. The second point is that we performed a relatively long follow-up (up to 24 weeks) during which participants' symptoms such as hypermenorrhea or dysmenorrhea were collected using a questionnaire. The participants' symptoms were not thought to be affected by bias, as the allocated interventions were confidential to the patients until completion of the 24-week follow-up. The third point is the participants' age and menopausal status. Participants' age was relatively young (about 38 years on average) in our study compared with that in four previous RCTs (49 years for van Dongen et al. 's trial, 54 years for Smith et al. 's trial, 52–55 years for Pampalona et al. 's trial, and 50–51 years for Hamerlynck et al. 's trial). The proportion of participants with a postmenopausal status was very low (2.9%, 2 of 67 patients) compared with that of four previous RCTs (27%–59%). The younger age and premenopausal status mean that the proliferation of endometrium is active in our trial's population, and this could influence the recurrence rate of endometrial polyps or improvement of the participants' symptoms. 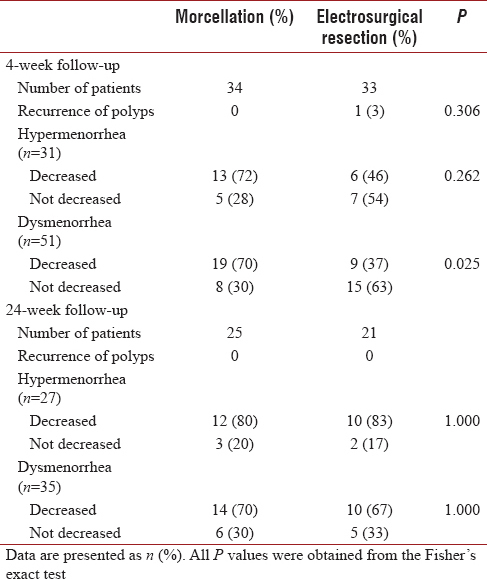 We observed the significant fact that in younger participants, there was no recurrence of polyps and 70%–80% improvements of symptoms at 24-week follow-up in the morcellation group. In addition, we observed the very interesting fact of the significant decrease of dysmenorrhea observed in the morcellation group at the 4-week follow-up. The precise reason for this finding is unknown, but the disuse of electronic energy in the morcellator system might have caused less damage to the uterus. Our study has several limitations. First, the sample size was relatively small. The sample size had enough power to show the reduction of the operating time – our primary outcome. However, our trial was not powered enough to detect a significant difference in the recurrence rate of endometrial polyps or the improvement of symptoms. Second, the surgeons were not blinded in the evaluation of the devices. Surgeons might have provided a better evaluation of the new device for hysteroscopic morcellation. Hysteroscopic morcellation was as effective and safe as electrosurgical resection, it obtained a higher evaluation from surgeons, and it shortened the operating time. Thus, this new device has the potential to become widely used in the Asia-Pacific region. Henriquez DD, van Dongen H, Wolterbeek R, Jansen FW. Polypectomy in premenopausal women with abnormal uterine bleeding: Effectiveness of hysteroscopic removal. J Minim Invasive Gynecol 2007;14:59-63. Afifi K, Anand S, Nallapeta S, Gelbaya TA. Management of endometrial polyps in subfertile women: A systematic review. Eur J Obstet Gynecol Reprod Biol 2010;151:117-21. Emanuel MH, Wamsteker K. The intra uterine morcellator: A new hysteroscopic operating technique to remove intrauterine polyps and myomas. J Minim Invasive Gynecol 2005;12:62-6.
van Dongen H, Emanuel MH, Wolterbeek R, Trimbos JB, Jansen FW. 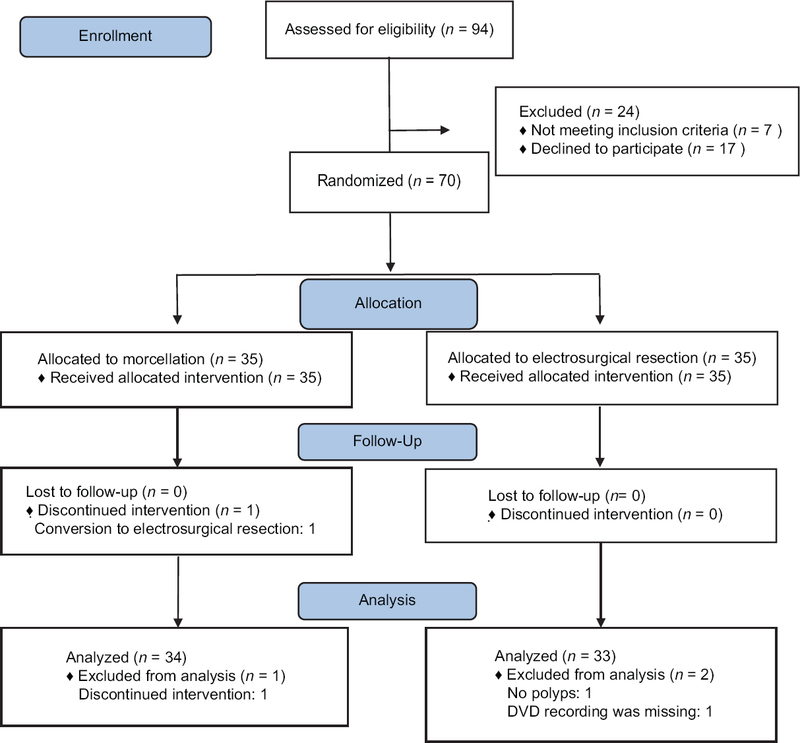 Hysteroscopic morcellator for removal of intrauterine polyps and myomas: A randomized controlled pilot study among residents in training. J Minim Invasive Gynecol 2008;15:466-71. Smith PP, Middleton LJ, Connor M, Clark TJ. Hysteroscopic morcellation compared with electrical resection of endometrial polyps: A randomized controlled trial. Obstet Gynecol 2014;123:745-51. Pampalona JR, Bastos MD, Moreno GM, Pust AB, Montesdeoca GE, Guerra Garcia A, et al. Acomparison of hysteroscopic mechanical tissue removal with bipolar electrical resection for the management of endometrial polyps in an ambulatory care setting: Preliminary results. J Minim Invasive Gynecol 2015;22:439-45. Hamerlynck TW, Schoot BC, van Vliet HA, Weyers S. Removal of endometrial polyps: Hysteroscopic morcellation versus bipolar resectoscopy, A randomized trial. J Minim Invasive Gynecol 2015;22:1237-43. Lee MM, Matsuzono T. Hysteroscopic intrauterine morcellation of submucosal fibroids: Preliminary results in Hong Kong and comparisons with conventional hysteroscopic monopolar loop resection. Hong Kong Med J 2016;22:56-61. Shazly SA, Laughlin-Tommaso SK, Breitkopf DM, Hopkins MR, Burnett TL, Green IC, et al. Hysteroscopic morcellation versus resection for the treatment of uterine cavitary lesions: A Systematic review and meta-analysis. J Minim Invasive Gynecol 2016;23:867-77. Li C, Dai Z, Gong Y, Xie B, Wang B. A systematic review and meta-analysis of randomized controlled trials comparing hysteroscopic morcellation with resectoscopy for patients with endometrial lesions. Int J Gynaecol Obstet 2017;136:6-12. Umranikar S, Clark TJ, Saridogan E, Miligkos D, Arambage K, Torbe E, et al. BSGE/ESGE guideline on management of fluid distension media in operative hysteroscopy. Gynecol Surg 2016;13:289-303.